We Went on Our First Cruise! 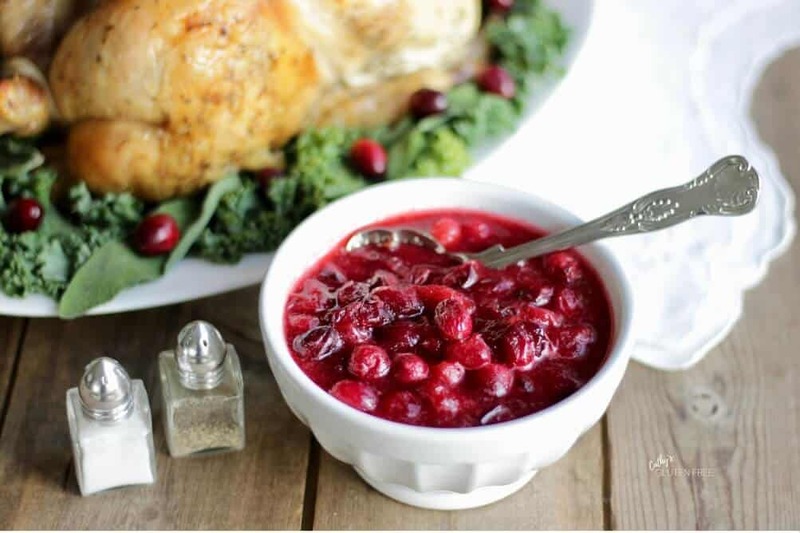 I think that cranberry sauce is the jewel on the crown of a holiday turkey dinner menu. Many might argue that dessert is the best part, but I submit that this simple side dish could rival for that position. 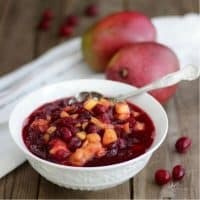 Colourful, juicy, and just sweet enough, Cranberry Sauce with Mango is destined to become a new tradition when I’m making Thanksgiving or Christmas dinner! Cranberry Sauce with Mango is a healthier, lower-in-sugar recipe than the usual cranberry sauce. 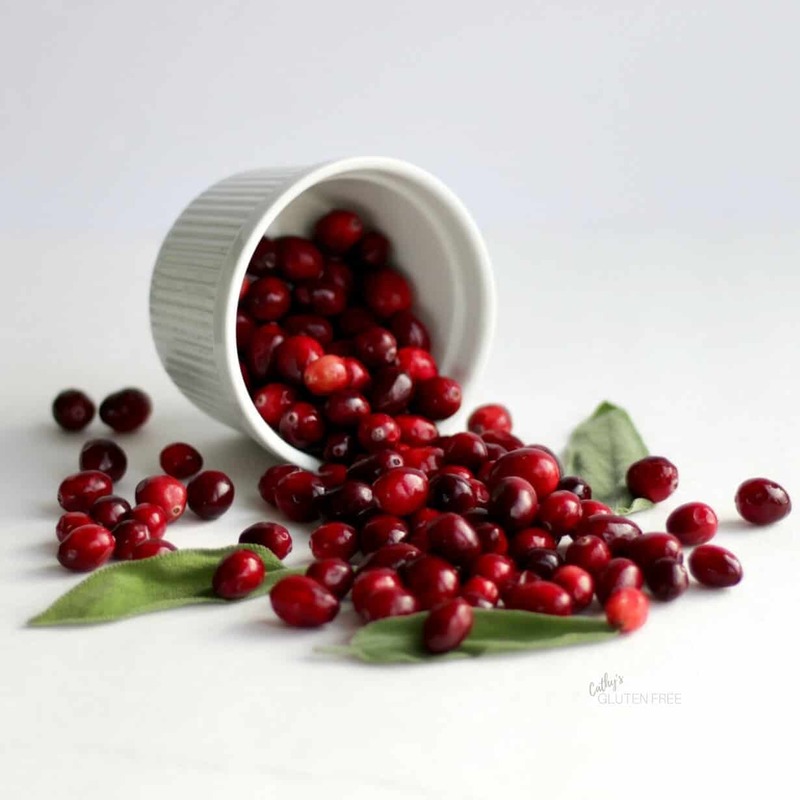 Cranberries are filled with nutrients and antioxidants. While I used to use the sauce from a can, and debates raged on and on regarding the jellied versus whole berry sauce, I have enjoyed making cranberry sauce from scratch for quite a few years now. Once I discovered how easy it is to make, I made it often. It’s amazing how you can just boil water, sugar, and cranberries together and have such a delicious sauce gel up so nicely! But All of That Sugar! However, I have a hard time putting in as much sugar as the directions on the cranberry packages call for. Even though I never use white sugar, a whole cup of any kind of sugar in one bowl of cranberries is a lot! I’ve tried making the sauce with coconut sugar, but it really alters the taste. Honey or maple syrup would, too. Then I tried making cranberry sauce with orange juice. I have also tried adding cinnamon, cloves, and allspice to distract from the lack of sugar. I just couldn’t get a result I was happy with – or that I thought you would like – when I cut back the sugar by twenty-five to fifty percent. So, imagine my delight when I arrived at this idea! 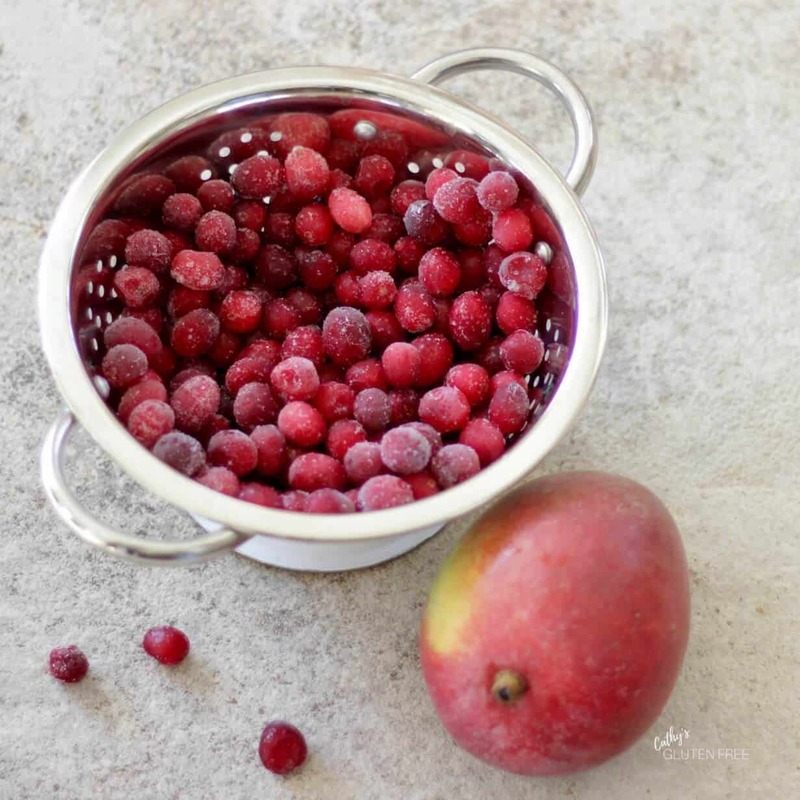 Frozen cranberries work just as well as fresh for cranberry sauce. One day, after being disappointed with another failed attempt at a “healthier” cranberry sauce and adding more sugar to the test batch to make it palatable, an idea came to me. There, in the fruit basket in front of me on the kitchen counter, was a lovely, ripe mango! I love mango, and I thought, why not? 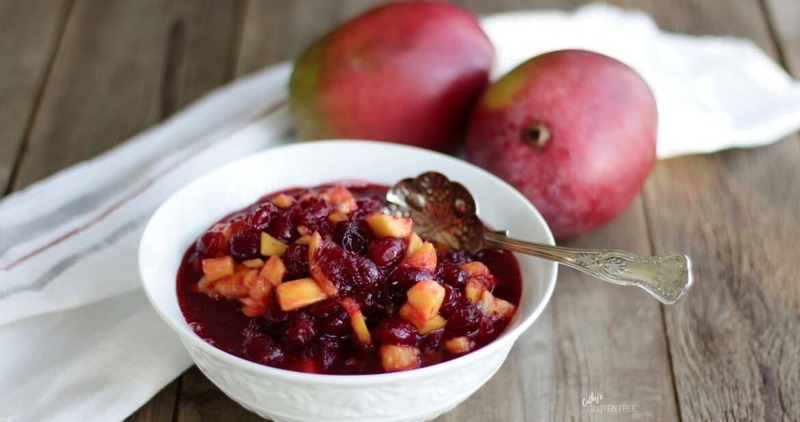 I chopped up the fresh mango, added it to some cranberry sauce, and served it to my husband for dinner to get his reaction. We both decided that it was great! 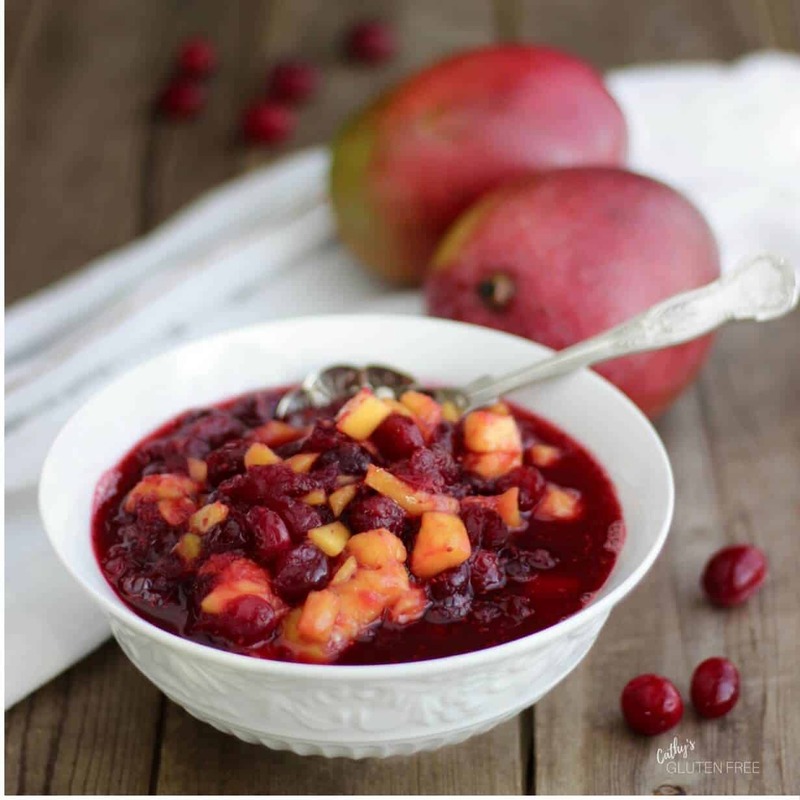 This recipe has a lower sugar content than the usual cranberry sauce. For the sugar I do add, I use organic raw sugar, which is minimally processed. Much of the sweetness comes naturally from a fresh, ripe mango. Plus – It’s super easy to make! This short video shows you how. Over medium-high heat, boil the water and sugar together until the sugar is dissolved. Add the cranberries and boil, stirring occasionally, until the skins pop. Allow to cool. 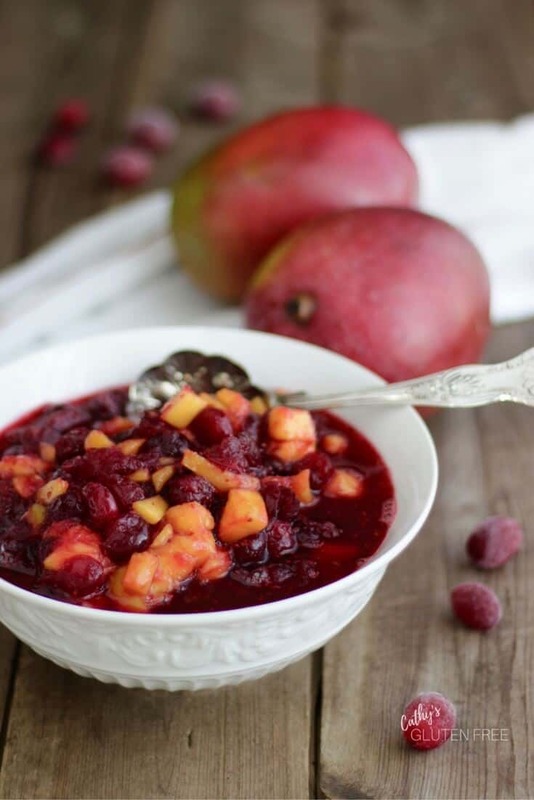 Stir diced mango into cooled cranberry sauce. It's great served at room temperature. Make ahead: You could cook the cranberries, water, and sugar a day ahead and store in the refrigerator. However, I would recommend adding the fresh mango on the day that you'll be serving it. Previous Post: « Start Here! 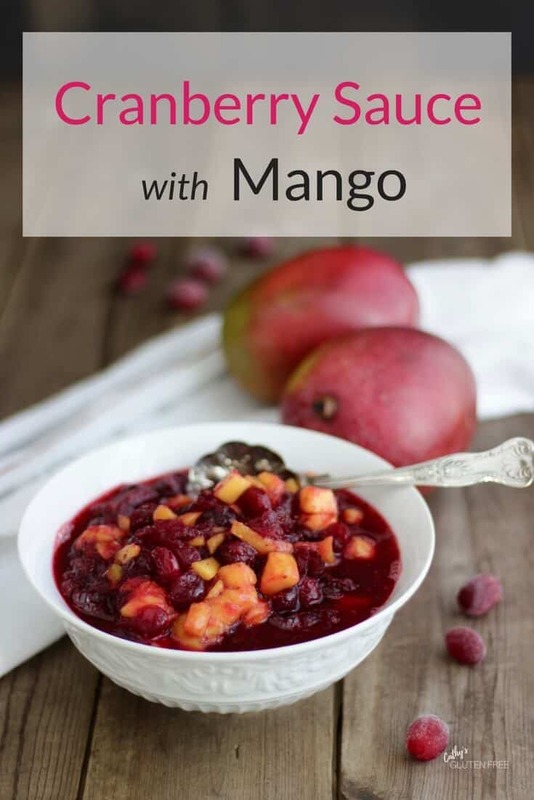 Adding mango is a great idea to replace some of the sugar, and I’m sure it must be delicious, too! It is delicious! Thanks for stopping by, Colleen. Thank you, Maria! I appreciate your stopping by and commenting! I love the addition of mango! I completely agree about the insane amount of sugar in commercial cranberry sauce, not to mention it never really tastes good. Cranberry sauce is another one of those things I refused to eat as a kid but then realized that I love homemade versions of it! Good job on this one, so simple and tasty. Thank you, Gabrielle! Isn’t it wonderful when these delicious, homemade versions are simple and easy to make, too! Very smart! My only concern would be finding mangos ripe enough!!! From a culinary standpoint it makes complete sense to add another sweeter fruit to offset the tartness of the cranberries. In past I have used combination of apple and oranges , but it does alter the taste from the ‘traditional’ version! The combination of apple and oranges sounds good! 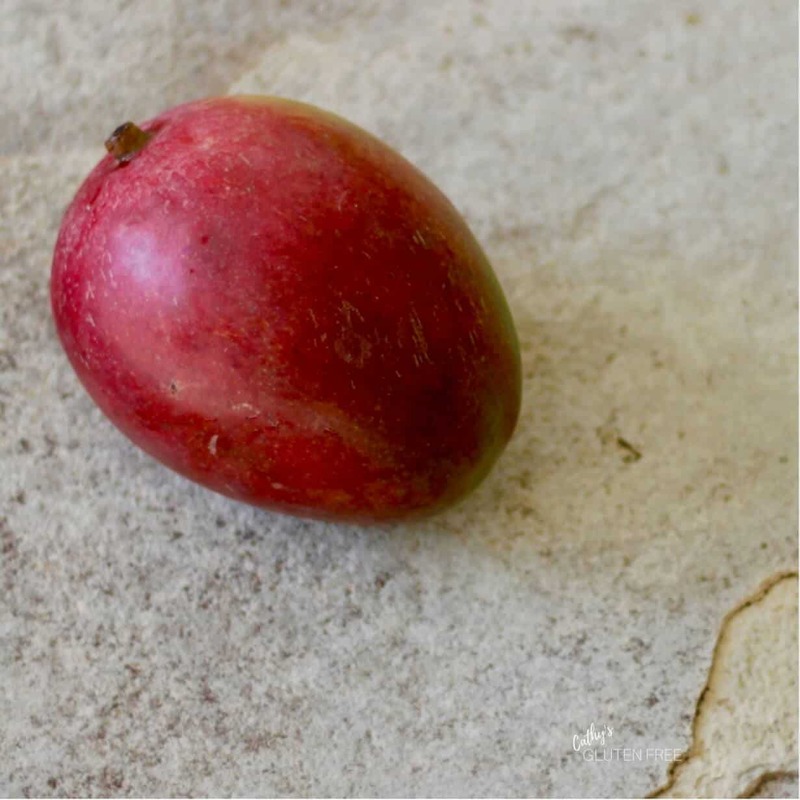 From a health perspective, I think the whole fruit complete with its natural fibre helps to slow down the absorption of the sugars compared to fruit juices or straight sugar. Welcome! You’ve come to the right place for wholesome gluten free food that tastes great!